VIP toilets for sale in South Africa, Durban, Johannesburg, Pretoria, Polokwane, Eastern Cape.Our VIP toilets are spared no expense when it came to the buying of materials or getting only the most qualified people to do the job right the first time. 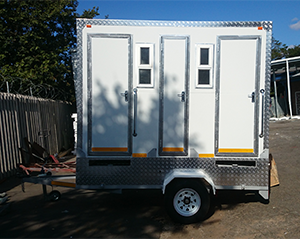 Our factory manufactures VIP Toilets for sale as the prototype in South Africa. The VIP Mobile Toilet is for sale and has become popular for any event exhibitions, parties, weddings & outdoor events. Our cost-effective VIP toilets do not mean that we compromise on strength and product quality. Our Toilets are manufactured by highly skilled workers and all our mobile products are affordable.This puts us ahead of our competitors and ensures client satisfaction at all times. We have a well-built reputation as the leading VIP toilets production manufacturers due to our unyielding dedication to our clients and service excellence. Our mobile kitchens can be custom made to your specifications if you desire it or you can purchase our standard design. Steel wipe down walls for heat-resistant interiors up to 500 degrees. Our mobile kitchens are number one when it comes to quality and design. We manufacture our Kitchens on an international level.